Taking concentrated fundamental bets is no different than playing craps in Vegas. A billionaire like Ackman could really use a lesson in risk control from a market technician. His hubris and ego has literally cost him billions. He’s failed to execute the most important rule to successful investing and trading — cutting losses. You would think he learned something from his first rodeo when he went “all in” on a failing company. Ackman’s first hedge fund, Gotham Partners, doubled down on a bad bet and blew up as well. But remarkably, he was able to convince more people to come ride the pain train again in his new fund — Pershing Square. The importance of risk management and trade management in the market cannot be overstated. That’s why at Macro Ops we use both fundamentals and technicals in our process. Stock picking and conviction is not enough to succeed in this game. In pure fundamental investing, it’s believed that the lower the price (all else equal), the more attractive the trade. This is because price is further away from the investor’s best guess (and yes it’s nothing more than a guess) of “fair value”. This is not the case in technical investing. Technicians approach the market in the opposite fashion. They would tell you that price below your cost is a signal to exit. You’re wrong and receiving negative feedback from the market. The attractiveness of the trade decreases as the price moves against you. We side with the technicians on this one. Arrogant fundamentalists like Ackman never admit defeat and never cut losses. Instead, they buy more because they believe they’re buying at a “better” price. Valeant just continued to fall lower after his purchase. 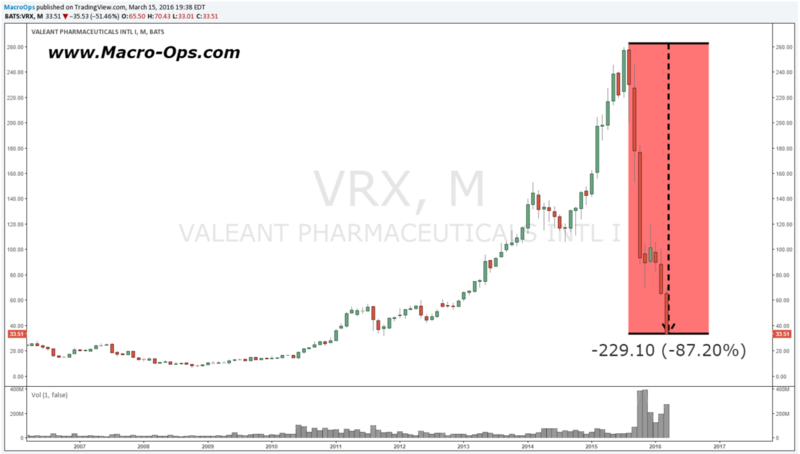 As you can see below, from it’s high, Valeant has lost over 87% of its value. This approach of averaging down and holding onto losing bets is nothing more than gambling. Investing icons such as Ackman like to make big calls. If they’re right, assets under management swell. If they’re wrong… the fund blows out. Which is exactly what happened with Ackman’s first fund, Gotham Partners. This approach to markets has zero risk control. It’s the “pennies in front of a steamroller” trade in different form. No one can continuously outsmart the market, even with a Harvard MBA. If you don’t cut your losses the market will do it for you with a margin call. And to make matters worse, your precious investors will redeem their assets once they see a big loss on their statements. This may come as a shocker, but the most important thing in trading has little to do with whether you find an undervalued stock that rises in price. Don’t take this the wrong way, trade selection has value, but it’s vastly subordinate to the path the underlying investment takes after you enter it, including how you manage that path. In other words, trade and risk management are a priority over everything else. A lot of people get confused when we talk about the “path of the underlying”, but the concept is simple. The three lines represent three different “paths” that could play out after you buy a stock. The blue line trends straight to the target with little drawdown. The yellow line gives you a lot of heat, but eventually comes back and hits your target. And the purple line rewards you right off the bat, but then takes a turn for the worse. The purple line is Ackman’s Valeant. It’s impossible to predict this path with any amount of accuracy. You can try, but attempting to do so is akin to guessing what next Saturday’s Powerball numbers will be. You have 0 control over whether people will buy your stock after you. You have 0 control over what management will do in a company you don’t even operate. You have 0 control over what the stock price does at all. But you DO have control over when you decide to hop on or off the path. At the end of the day, what shows up on your account statements are your entries and exits. Not your 80 page thesis that you touted to your Ivy League colleagues. The cold hard profits and losses created by your buying and selling is the only thing that matters. Take any of your favorite performance metrics: sharpe ratio, gain-to-pain ratio, sortino ratio, and calmar ratio. They all look at your equity curve, not your research. Your equity curve is what graphs your trading account’s performance. So ultimately, how you manage risk is what moves these numbers up or down. Your returns over your drawdowns is what matters the most, not whether you ended up being right on a thesis. This is why trade and risk management are far more important than investment selection for longevity and performance in the markets. Pictured are three different scenarios, all of which you were “right” at some point during the trade. Scenario one is the blue line. The blue line is the easiest path to stomach. It has little drawdown and slowly trends upward towards your valuation target. In raging bull markets, like we had since 2009, a lot of hotshot investors saw their picks trade in this fashion. They touted their “genius” and “insight”, which the investing public bought into, causing those managers’ AUM to soar. Scenario two is the yellow line. This is where things become tougher. Yes, your target was eventually hit, but look at the drawdown you had to suffer through to get there. Could you realistically stomach paper losses for the first year or so you were in the trade? How much doubt would you have? Also, holding this will put a dent in your performance metrics. Holding onto any type of drawdown will. Guys like Ackman will typically hold the yellow line or even double down on the yellow line. This may work great for a while, until a purple line pops into your life… which can happen even if you’re a seasoned billionaire. Scenario three is the purple line — the most painful of them all. You bought the stock, and were immediately rewarded. But it didn’t quite hit your valuation target. You were hoping for more from your little darling. Then, unforeseen information comes out and the stock starts to take a turn for the worse. But the initial run up made you confident that the stock is a good company and that it’ll “come back.” Yet as time passes, the stock drops, and you become more and more wrong. The anxiety and pain is now at level 11 out of 10. You aren’t sleeping at night. You’re pulling your hair out and questioning whether you had any investing skill in the first place. The problem is you never exit and control risk because you believe in your own story over the market. The purple path is what finally blows out the arrogant who refuse to respect price. Holding onto a purple path is a career ender. It involves PERMANENT capital loss. And permanent loss in equities happens a lot more than you would think. You just never hear about the losers. Technicians wouldn’t stay on the purple path. They would react to the adverse price action and protect their profits. Or at least exit that trade for a small loss. If stocks were illiquid like private investments, you would be stuck on the “path” and all the anxiety and negative emotions that come with it. But lucky for us, they aren’t! You don’t need to suffer through a purple path if you have appropriate trade and risk management. Fundamentalists can take a page from the technician’s handbook and have their entry and exit rules determined before they enter a trade. With rules in place, you can recover when you’re wrong and limit your account drawdowns to something that’s not career ending. If you don’t control the path, the path will control you.